Sur les Hauts de Céret, légèrement en altitude donc profitant d'un climat plus tempéré qu'en bas (surtout avec la canicule de cette année), cette belle maison offre une superbe vue et un environnement très calme propice à de bonnes vacances détente, le tout au bord d'une très agréable piscine à débordement. Attention juste, vu le prix de la location, à continuer à bien entretenir la maison, surtout l'électroménager (TV principale HS - et pas de chaines françaises-, réfrigérateur fatigué, pas vraiment normal à ce tarif mais nul doute que cela sera corrigé rapidement). Idéal pour rayonner dans la région, 1/2 h d'Argelès ou Collioure, escapade en Espagne facile, Châteaux Cathares à 1h30 et nombreuses activités dans les environs. All I can say is I want to live there! Fantastic house, homely & comfortable, set in the most stunning location. 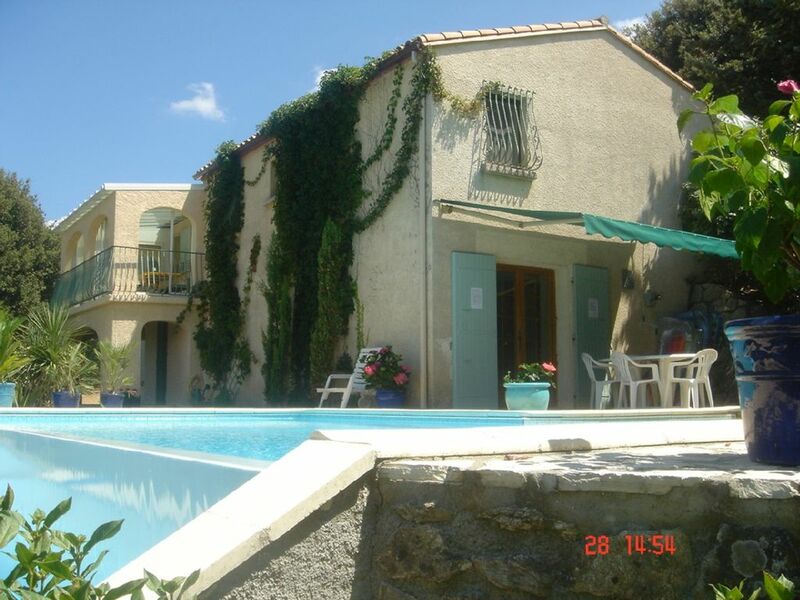 Located in the hills above Ceret this house is the perfect base for those who like to visit numerous locations. From here you are surrounded on all 4 sides by The Pyrenees, The Med, France & Spain. I would highly recommend this property to anyone who enjoys a peaceful relaxing location with amazing views and everything you require just a short trip away. The owner is a wonderful woman who cannot do enough to help you prepare for your stay, I will miss chatting to her. We can only thank her for allowing us to stay in her lovely home which made our holiday a very memorable holiday. We are a couple in our 60's with a dog, interested in walking and sightseeing. We stayed here for 25 days and were joined by our daughter and husband and her 2 children under 2 for 10 days. This well maintained house was as described and any problems we had were dealt with promptly. The house was comfortable and well equipped with plenty of room for larger numbers. The terraced garden provided shaded areas for sitting as well as table tennis, badminton and boules. Two bbq's and two outdoor tables, one at the pool and the other beside the kitchen made for variety in outdoor eating. We enjoyed enjoyed breakfast in the sunroom looking over the view of the valley below. We also had fun with the pinball machine in the evenings! A minor disappointment was the limited seating/lounging area around the pool when our daughter etc joined us. The weather was in the mid 20's which was perfect for walking but consequently the pool was surprisingly cold. Ceret, 15 minutes by car, is a delightful town with a most attractive medieval centre and some typical restaurants with a variety of prices and menus. We would recommend this house but not for very small children due to unprotected drops in the garden by the swimming pool. Back a week already, it's time to write a little feedback. We liked our stay very much. Your house is spacious. We were with four, but I can see it easily working with 8 or 2x4. The pool was great and very nice situated with a view to the valley. Also well serviced. The house is also very relaxed. It's livable. Not like an interior designer's showroom. The big downstairs bathroom was very nice. Looked new. All kitchen equipment (that we used) worked perfect. We liked the table tennis and badminton. The mosquito nets in front of most windows was also very much appreciated. I think mentioning more about thing that are available in and around the house would give it an even more positive appeal. All in all we are happy and satisfied with our stay. No hidden nasty things. I would say : "as advertised". My family (2 adults / 2 teenagers) stayed in this property for a week in June. I have used Holiday Rentals in previous years and have never been disappointed with the properties we have stayed in. This year was no exception. In advance of our arrival the owners sent some additional information I had requested about access to certain sporting facilities which was very helpful. I found the description of the property on the website accurate regarding its location, layout, amenities etc. The villa sits high on a hill-side, looking next Ceret and is accessed by a road which dramatically twists and turns until you almost reach the summit. Quite unnerving on the first ascent, especially driving on the 'wrong side' of the road but by the end of the week we were well used to it. The journey up however is well worth it, as the views, especially from the infinity swimming pool, are magnificent. Our children had just completed their exams and this property provided us all with a marvellous location to wind down and relax. Whilst the property was secluded, it was only 10 minutes away from the wonderful town of Ceret where there are a number of good restaurants and enough to keep us well-occupied. The property was clean and well maintained. It was well-equipped, having a piano, a wide-screen TV, a sound system with a good selection of CDs and books.Outside there was a badminton net and a table tennis table with all the necessary racquets, bats etc and inflateables for the pool Throughout our stay the owners were easily accessible by phone to deal with any inquiries we had. I would have no hesitation in recommending this property to a friend.